A gorgeous verdure scene showing a hunt in medieval times. This tapestry shows nobles on their horses running through the forest in their hunt accompanied by their many hounds. These verdure tapestries which depicted the beauty of nature and the forest emerged in the 17th century and were a celebration of nature. Here in this hunting scene we see a flowing composition of nobles riding as well as the refined beuty of the countryside itself. 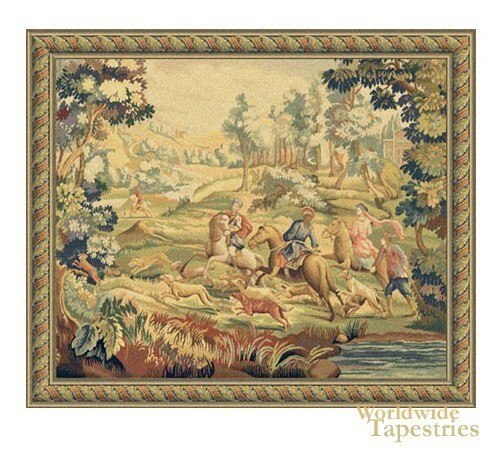 This tapestry "Hunt" is backed with a lining and has a tunnel for easy hanging. Dimensions: W 60" x H 48"